Find hotel near Cresmina Beach Or Praia D ..
Less touristy and less accessible than the other beaches around, the Cresmina Beach is famous for its great expanse of sand and for the high winds that whip up strong waves in the waters. This makes it a particular favourite with surfers. It enclosed by rocky cliffs, but you can get here from the nearby Guincho Beach by a stairway and a ramp. Thankfully, there are still bars and restaurants surrounding the beach. It’s a great place for families too. For sheer natural beauty, this is one of the best beaches around. By car : Guincho National Road N247 or Malveira da Serra Road. 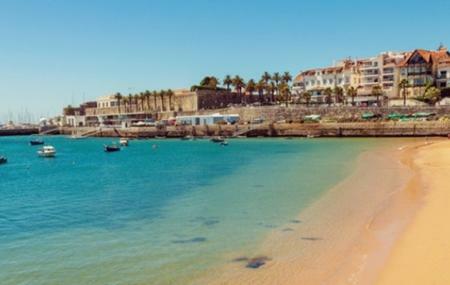 Ask a Cascais local, or the tourist office about which buses run to the beach. Restaurants and bars near the beach. How popular is Cresmina Beach Or Praia Da Cresmina Ou Pequena Do Guincho? People normally club together Guincho Beach and Santa Marta Lighthouse Museum while planning their visit to Cresmina Beach Or Praia Da Cresmina Ou Pequena Do Guincho. Nice parking, not far away from beach, clean sand. Perfect! Surfers love this place definitely. Stopped of here with a campervan, off season in March. Beautiful rural spot with some restaurants. Great for campervans and outdoors walking/cycling/running. But maybe a bit away from facilities for families. Friendly atmosphere great burgers and snacks cocktails , the top spot for everyone who enjoys a laid back atmosphere. And of course the beach Cresmina, where else !